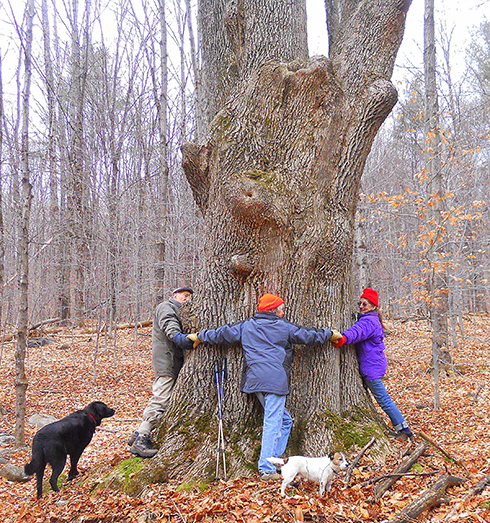 By popular request, there will be a springtime hike to the largest White Ash in Vermont on Saturday May 19 from 9:30 AM to noon. The rain date is Sunday May 20. The tree is located on Windmill Hill Pinnacle Association property off Headwaters Trail in Westminster, so a guide to it is essential. This year the walk will be led by Vermont State Forester Tim Morton. During the free program Morton will discuss the characteristics of a Vermont forest and the factors that affect the health of this truly remarkable specimen, which should be on display in all its leafy glory. Re-verified at the beginning of 2014 by Windham County Forester Bill Guenther of the Vermont Department of Forests, Parks & Recreation, the tree grew in the ten years since its last measurement and charted a circumference of 205.2 inches and a height of 113 feet, thereby beating out two other Westminster giants for the honor of being the largest White Ash in Vermont. Participants should wear hiking shoes, bring water, and meet at the Westminster West Church to carpool to the trailhead. Click here for directions to the church. Please contact Elaine Gordon at esudgor@yahoo.com or 802-869-6103 for further details. Pinnacle’s gigantic champion ash was a measurement stretch for enthusiastic hikers.